The Sonos voice range combines normal sounder signals with a clear, synchronised voice message to help reduce confusion and distress during an active alarm. Units are available with 7 pre-programmed messages, selected from an extensive message library covering almost any conceivable application. Bespoke messages are also available on request. 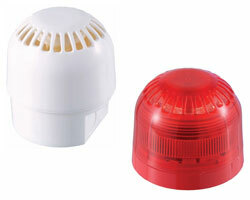 These sounders can be used in small to medium fire alarm system installations where up to 7 messages can be transmitted over two wires via a message controller. Both Sonos voice enhanced variants are available as sounders or sounder-beacons in either red or white, with shallow or deep base (IP65) options for indoor and outdoor applications.